Microsoft's beta was full of shocking omissions, and what shipped is even worse -- but there's a glimmer of hope. Microsoft's beta was full of shocking omissions, and what shipped is even worse - but there's a glimmer of hope. From the first time I got a good look at Windows Phone 7, it had all the earmarks of the end of the line for Microsoft's mobile aspirations. After spending an hour with a beta version of Windows Phone 7 in July along with a room full of developers, I was shocked (as were they) at how much was missing from the OS and thus how incapable it was -- there were no signs of copy and paste, multitasking, devicewide search, or HTML5. I wrote then that Windows Phone 7 was a disaster that everyone should avoid. Now that Windows Phone 7 is shipping, the truth is even worse. I spent several days this wek reviewing a Windows Phone 7 device; in the process, I realized Microsoft made even more boneheaded decisions than I thought possible. You can get the detailed analysis in my deathmatch comparison between Windows Phone 7 and the iPhone 4, but Microsoft's made several additional and unthinkable lapses. What's really sad, however, is that it didn't have to be that way. Windows Phone 7 does have a strong user interface -- much better than I originally thought (I take back that earlier criticism) -- that could still serve as the basis of a successful mobile platform if Microsoft moves very quickly. What's wrong with Windows Phone 7 is partly technological and partly strategic, so moving from the bad 1.0 version to a strong 1.1 version by this spring (any later is pointless) would be no mean feat. Let me explain. Windows Mobile was second only to the BlackBerry when it came to being secure. Even the military could trust it. By contrast, Windows Phone 7 is less secure than most other mobile OSes, with even fewer security capabilities than Google's Android OS. The big three missteps are lack of on-device encryption, lack of support for complex-password policies, and lack of VPN. These are basic requirements of any business to allow access to their corporate email and networks. I really want to know how much security Microsoft will have to relax on its own network so that its employees, who are all being issued Windows Phone 7 devices, will be able to access it. The result is that Apple's iPhone -- which started as a consumer device -- is now the second most secure device after the BlackBerry, and it's gaining trust at financial institutions, hospitals, and other regulated businesses, while Windows Phone 7 can't even be considered. How stupid was that decision? The ray of hope here is that Microsoft has delivered the required security before, so it should know how to do so again. Windows Phone 7 has a set of apps called Office: Word, Excel, and OneNote. But don't let the Office name fool you - Word and OneNote are very rudimentary apps, good for basic notes entry and extremely light editing. For example, tap and hold a word to select it or tap and drag to select a range of text; from there, you can make it bold, apply a colored highlight to it, or add a note. You can't choose fonts, though you can apply numbered and bulleted lists. Note that when I tested mobile Office using the Samsung Focus, I could select only one word at a time, no matter how hard I tried to select more. I assumed that was a limitation in mobile Office, but later testing on an HTC Surround shows the text selection works quite easily on that device. It's unclear why I could not select more than a word at a time on a Focus, though a possible cause could be its touchscreen, which was less sensitive than other smartphones I have used. More irony: Sure, Office for Windows Phone 7 can connect to SharePoint servers -- assuming that you let your security guard down, of course. And when connected to SharePoint, there's little you can actually do with the documents you have access to. What's the point? If any company should have been able to adapt Office to the mobile environment, it's Microsoft. What it delivers is less capable than a $15 app from a company no one ever heard of such as Quickoffice (available for iPhone, Android, BlackBerry, and WebOS) or DataViz's Documents to Go. If you want Office on your smartphone, you'll need one of those apps running someone else's smartphone. I like the Windows Phone 7 user interface -- it's clean, simple, and intuitive. Even though it made a positive first impression on me, my Vista- and Office-fueled doubts about Microsoft's UI abilities led me to expect the worst in the final version, and I saw signs of Microsoft gumming it up in July. I was wrong in those fears. What it has now is elegant. It reminds me very much of Steve Jobs' NeXT computer and OS: spare but attractive. It's not quite as flexible and nuanced as Apple's iOS, which allows complex functionality in usually intuitive ways, but it's a much better UI than Google's Android, RIM's BlackBerry, or Hewlett-Packard's WebOS. The problem is that under that pretty, toned exterior lies a couch potato of an operating system, one that seems unwilling and perhaps unable to hoist itself off the couch. It's not so much lipstick on a pig as it is lipstick on a sloth. Fix the OS and its apps, and stay true to the UI. One of the biggest problems with Windows Phone 7 is that the assumption behind its focus is flawed. Microsoft has created a consumer smartphone meant to compete at the low end of the market with the bazillion feature phones that come and go, not one designed to meet the needs of the business market. It certainly doesn't compete with the iPhone's or BlackBerry's "use it for personal and business as you like" market, which is the one of growth. In fall 2008, Microsoft was working on the successor to the poorly received Windows Mobile 6.5. Apple's iOS had truly changed the picture in mobile, and Google's then-new Android looked to be playing that new game. Microsoft chose to enter the realm as well by starting from scratch, dropping the Windows Mobile platform, and developing an all-new modern smartphone OS in what Microsofties call The Reset. It was the right strategy. But where Microsoft went wrong was also deciding to develop a smartphone OS only for consumer users, following an odd preoccupation with teenagers and 20-somethings. I can see the argument for a consumer-only strategy may have made some sense in fall 2008 -- Apple's iPhone didn't yet have strong business functionality, which Microsoft and others ironically criticized it for -- and the "bring your own device" phenomenon had not yet taken root in business. But wasn't that the point of the ill-fated Kin? There was every reason not to jettison the business customers -- Microsoft should have decided to develop a new OS that pleased its Windows Mobile business market and extend out to the consumer and professional markets. After all, that's the successful strategy of its Windows and Office products and ostensibly the strategy around its cloud efforts. A "have it all" platform with an elegant interface would have gained strong traction by Microsoft's many customers, especially those business users tempted by the iPhone but not so sure about Apple and unhappy with RIM's slow move beyond messaging. Again, I can see the reasons for a consumer-only strategy in fall 2008, when the hot competition was a then consumer-focused iPhone. 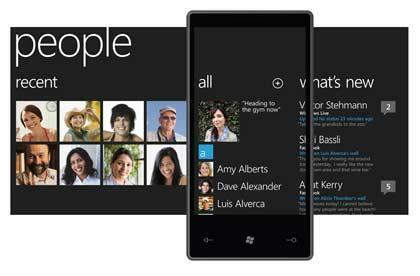 But by winter 2010, when Microsoft was ready to show beta versions of Windows Phone 7, the world had changed. Apple had transitioned the iPhone in to a multimarket device, and businesses were starting to accept the new reality. Microsoft's largest mobile competitor in the business world, RIM, also was moving in this direction. Microsoft wouldn't adapt. It admitted all the deficiencies that winter, but said it would not address them before product release in the fall. It was clear that the OS development effort was locked -- Microsoft was on a schedule for holiday 2010 release. As a result, we saw a triumph of schedule over successful product development, and an indication that Microsoft is unwilling or unable to be agile, nor actually trying to win. The reaction to the omissions among the developer community should have been Microsoft's first clue that it was letting schedule triumph over successful product development. By then, the "bring your own device" phenomenon was declared a reality by Forrester Research and others -- another clue that maybe it should not release Windows Phone 7 with its current focus. However defensible Microsoft's assumptions might have been in fall 2008, they weren't valid in winter 2010. And they wouldn't be when Windows Phone 7 shipped in fall 2010. Now Microsoft is selling a crippled product that can't be used in business, while its intended customers - individual consumers - are all gaga over Android, which is slowly moving to be business-capable as well. The results is that Windows Phone 7 is now failing both its intended customers and the company's historic customers, even as its competitors keep getting better and more entrenched. This is a Titanic-style disaster.